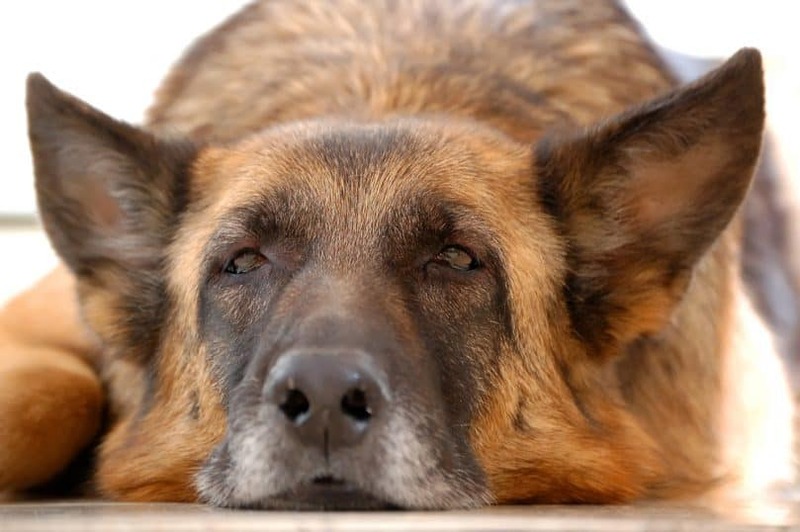 The most common reasons German Shepherds are put down are musculoskeletal disorders and an inability to stand. One of the most common problems these dogs face which cause both of those is hip dysplasia. Although it’s not always preventable, there are things you can do to keep your pet from becoming another statistic. Keep reading to find out more about what hip dysplasia is, and what you can do about it. Are German Shepherds Prone to Hip Dysplasia? The hip joint consists of two parts: the socket on the pelvis and the ball on the femur. 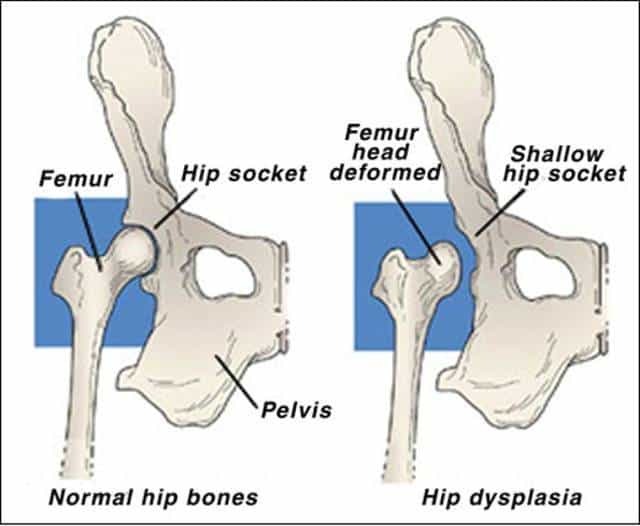 In hip dysplasia, a malformed socket doesn’t allow the ball to sit deep inside. This leads to instability, pain, and other symptoms which we’ll cover in more details later. Early intervention gives dogs with hip dysplasia the best chance at a long, comfortable life. So, if you have a dog breed that is prone to hip dysplasia, you need to look for symptoms to start managing the condition. Unfortunately, yes. This beautiful breed is prone to hip dysplasia with around 20% of evaluated dogs showing signs of it. If you are looking into buying a German Shepherd puppy, the first thing you need to do is check to see if the breeders certified the hips of the parents. This is because hip dysplasia is genetic. If the breeders don’t certify their dogs’ hips, stay far away from them. Hip certification involves having specialized x-rays taken of your dog’s hips after the age of 2 to look for early signs of hip dysplasia. 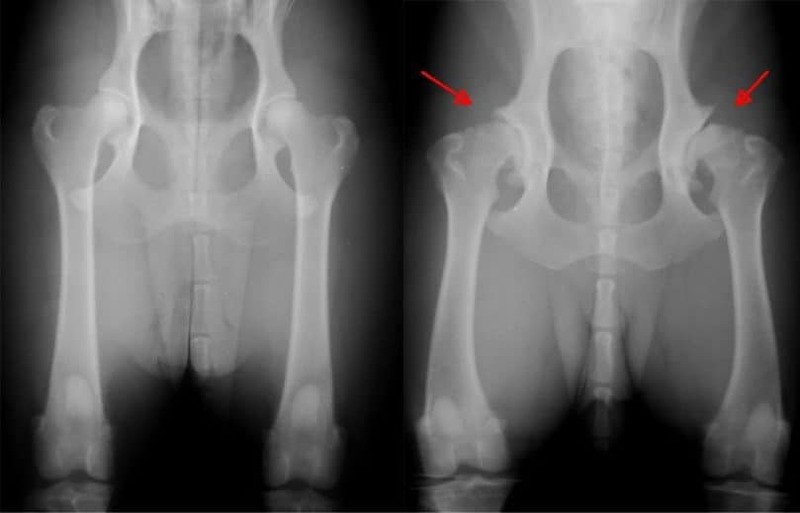 Although a clean x-ray doesn’t guarantee that a dog won’t develop this condition, it does mean that they probably don’t have the hip dysplasia genes. With nearly 1 in every 5 German Shepherds developing hip dysplasia, it seems like there would be more people working to end it. However, there is one huge reason that this condition continues to be so prevalent in this breed: money. People that see the popularity of this breed recognize it as an opportunity to cash in. They have no desire to improve the breed and so they don’t practice good breeding habits. 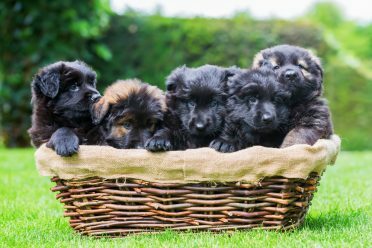 For these reasons, it’s vital that you buy a German Shepherd puppy from a good breeder who wants to improve the breed more than they want to make money. Unfortunately, even well-bred GSDs can still end up with hip dysplasia because the gene can skip generations. So, keep an eye out for symptoms so you can begin managing the condition from an early age. 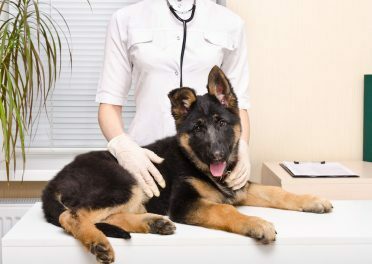 A German Shepherd is full grown after the age of two, so if any of these symptoms show up after that time, your dog is considered an adult. This is mostly important for determining treatment options. As you’ll note, most of these are the same as the puppy symptoms. The older a dog gets, the harder it is to treat this condition, so don’t wait for things to get worse before bringing them into a vet. In this video, you can see a German Shepherd “bunny hopping.” This is a movement in which they move both of their back legs at the same time while jogging or running. The only way to know for sure that your GSD has hip dysplasia and not another condition is to get x-rays. These are a specialized type of x-ray, so make sure your vet has experience with this test. It’s painful for the dog to have this type of x-ray taken, so you don’t want them to have to do it again. Here are two hip x-rays. One is of normal (left), healthy hips and the other is of a dog that has hip dysplasia (right). If you look closely, you can see the way the ball of the hip sits deep in the socket in the healthy hips and how it’s only partly in with the unhealthy hips. The best way to prevent hip dysplasia is to avoid the gene from being passed down in the first place. If you’re planning on breeding German Shepherds, be sure to use good breeding practices. Most importantly, always certify your dog’s hips before breeding them. Dogs can carry the gene even if they’re not affected by it. So, it’s ideal to look back at several generations for certified hips. Your vet is the best person to talk to about the best form of treatment for your dog, but here are some of the options that you may have. There are several procedures for hip dysplasia, depending on the severity of the condition and the dog’s age. In severe cases, a total hip replacement is usually recommended. Although surgery is the most expensive treatment option, it may also be the best. Around 90% of dogs that have a successful total hip replacement live pain-free lives following recovery. The cost of hip dysplasia surgery varies between $1,700 and $4,500. The exact cost will be determined by your veterinarian and could end up going higher. These can help dogs with hip dysplasia live a much more comfortable life. You may also start them on supplements from a young age. This can help prevent them from developing it in the first place. 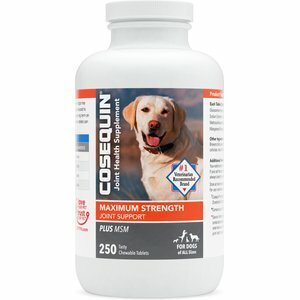 The two main ingredients in these supplements are glucosamine and chondroitin. Glucosamine is naturally-occurring in the body. It helps build the structures that make up joints including cartilage, tendons, ligaments, and the synovial fluid which lubricates the joints. For use in supplements, it’s usually extracted from oyster shells. Chondroitin sulfate is another compound that is naturally-occurring in the body. It makes up cartilage and can also stimulate the repair of cartilage. Most often, it’s sourced from the cartilage of pigs and cows as a byproduct of the food industry. 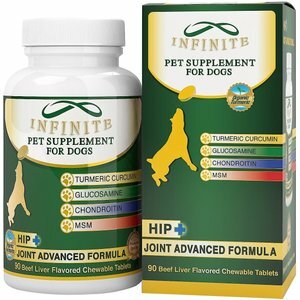 This liver-flavored joint supplement contains a proprietary blend of compounds which can all help with hip dysplasia. Some active ingredients include: glucosamine, chondroitin, Devil’s Claw extract, and turmeric. These are chewable tablets that contain several ingredients which help reduce inflammation and improve joint health. The active ingredients include: glucosamine, chondroitin, methylsulfonylmethane (MSM), vitamin C, and grape seed extract. Beef-flavored chews that are easy to give, this supplement only contains 4 active ingredients to maximize the dosage of each. The four active ingredients are: glucosamine, chondroitin, MSM, and organic turmeric. These tasty chewable tablets are extra-strength, making them ideal for dogs that already have hip dysplasia. They won’t work as a lifelong supplement. 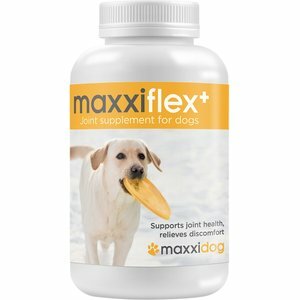 They contain these four active ingredients: glucosamine, chondroitin, MSM, and manganese. Even though these supplements are generally safe, always check with your vet before starting your dog on supplements. This is especially true if they’re on other medications or have other health concerns. Another way you can improve your German Shepherd’s mobility is with a dog wheelchair. This helps support their back end so they don’t have to use their back legs much or at all. German Shepherds will need a large dog wheelchair. Although they can be a bit pricey, the joy they give to your best friend is priceless. Here’s a video of a German Shepherd using a wheelchair. He has degenerative myelopathy (a nerve condition), but you can see what a difference a wheelchair makes. 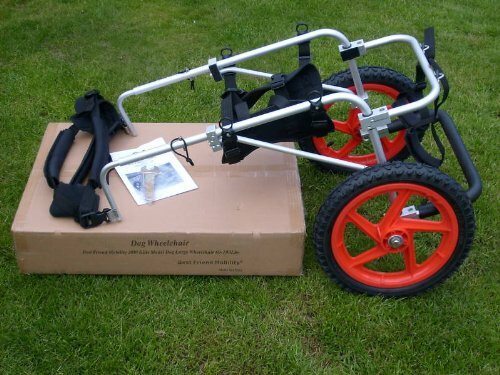 If you’re handy enough, you may also be able to build your own dog wheelchair using PVC or aluminum pipes. Going this route requires some basic building abilities as you want to make sure the wheelchair works properly. There’s also this support sling which you can use to help your dog get up and down stairs, and in and out of vehicles. 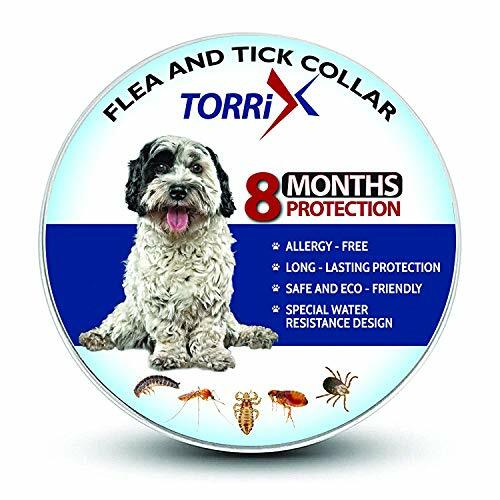 It’s fully adjustable so you can help your best friend get around as needed. Whichever you choose, these mobility supports are a great way to help your German Shepherd. 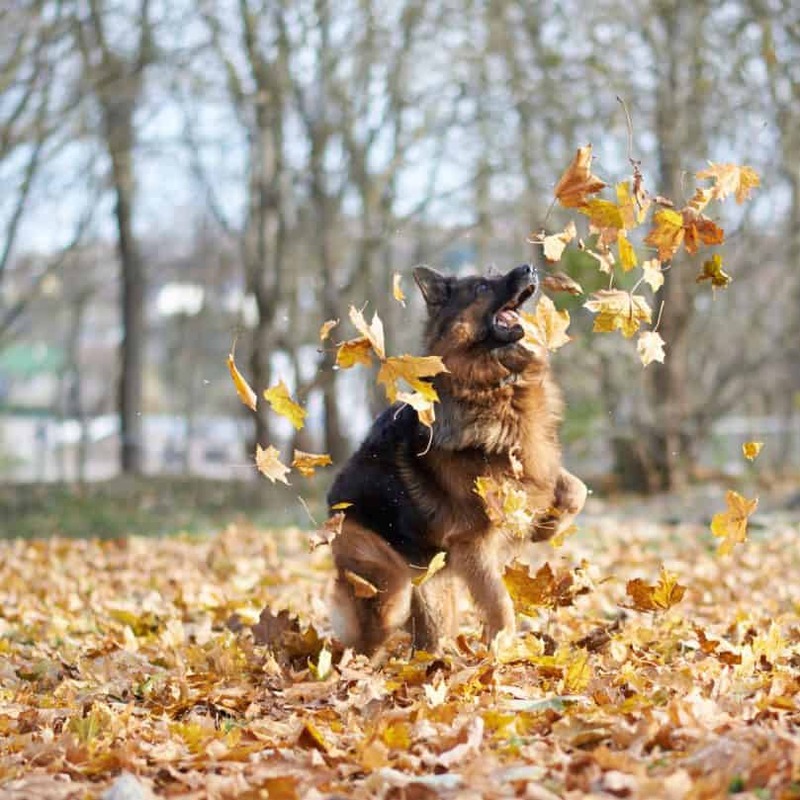 Although it may seem scary, there’s no need to panic if your GSD is diagnosed with this condition. The prognosis for hip dysplasia is generally good, especially if it’s caught early. If you’re willing to put in some effort, your dog has an excellent chance at living a long and comfortable life after diagnosis. Hopefully, this post gave you everything you need to know about German Shepherds and hip dysplasia. The most important thing to remember is that it’s not a death sentence. With proper management through surgery, use of a dog wheelchair, or supplements, your best friend can still live life to the fullest. Please comment below if you have any more questions for me or if you have your own story to share. I always love to hear other people’s stories, especially about my favorite breed!